42 posts categorized "Free Money Finance"
What This Site is About states clearly the objectives of the site -- to help you grow your net worth. Why this Site Exists is similar, but also gives the reasons why I'm blogging. Disclaimer notes that you should use the information on this site at your own risk. My Promises contains the commitments I make to my readers. Ground Rules lists readers commitments to me (and to themselves). Five Principles to Increasing Your Net Worth is my (current) way to best communicate the principles that have helped me grow my net worth. Free Money Finance Principles Summarized details the five principles. I Apply My Own Advice -- I'm not making this up as I go along and I'm doing what I say I'm doing. Tour of FMF. It's a bit dated, but it will lead you to some good stuff. Thanks, all, for continuing to read, and welcome to you if you're new. I'm glad to have you here and hope your time at FMF helps you grow your net worth by leaps and bounds! Just a pre-travel announcement here at Free Money Finance. I will be heading out of the country to visit Moscow, Russia on November 13. I will be out of the country until November 23, and since Thanksgiving is the next day, I may not get back online until the 25th or 26th. I'll have limited access to a computer and the web during this entire time, so if you email me or leave a comment and I don't respond, please don't be offended. I'm just inaccessible for awhile. Add more "personal" to the subject of personal finance. In other words, talk a bit more about my experiences, likes, dislikes, thoughts, etc. I've been sharing more thoughts and examples from my life over the past month and plan to do even more in the future. To this end, I'm starting a new feature called "FMF Speaks". Look for the first post on this subject to come out soon. Include more information on investing. I've also started to do this -- adding more articles on investing from various experts. In addition, I'll be covering more of what I do and how I manage my investment portfolio (warning: it's boring, but effective) as part of "FMF Speaks". Thanks to those who commented! Hopefully, everyone will benefit from their willingness to make suggestions. I'm not blogging today -- plan to enjoy the family before school gets up and running at full speed. I'll be back tomorrow with more money news, commentary, tips, and thoughts. Welcome to all of you who have read about Free Money Finance in the Wall Street Journal today. I'm so glad you stopped by and I hope you find your experience at Free Money Finance to be a good one. A few weeks ago, Free Money Finance was recognized by Business Week magazine and at that time I wrote a post that serve as a tour of Free Money Finance. If you'd like to take the "official tour" as well to see for yourself what this blog is about, simply click here. Note: For those of you interested, you can read The Wall Street Journal article (at least for now) here without a subscription. There are concrete reasons to keep your financial documents in order, no matter what your personality type. For starters, it's a cinch that you'll have to put your hands on some of these papers in the future--to file your taxes or an insurance claim, for example--so it makes good sense to keep them in a logical and readily accessible location. It's also essential that your heirs be able to locate your important financial documents. Finally, keeping your financial paperwork organized will tend to keep you in touch with your personal balance sheet. If you're filing your financial documents as you receive them, you'll be forced to reckon--whether you like it or not--with how much you have in assets and how much you owe. You will thus have a better sense of where any potential trouble spots might lurk. 1. Learn what to stash and what to trash. There's a reason many of us put off organizing our financial paperwork and tend to hang on to too many documents: Throwing out a financial statement that we might need for insurance or tax purposes has more serious repercussions than pitching a sweater that just might come back into style. But few of us have the space, let alone the discipline, to squirrel away every last receipt and statement. So throw away those unneeded papers. Buy a shredder and use it to destroy the myriad documents that include your name or other personal information on them. 2. Know where to put what you keep. If you have a filing system that works for you, great--proceed to Step 3. If you don't, I'd recommend a three-tier scheme: one for documents that relate to the current year; one for papers that you need to hang on to but have no immediate need for; and a safety deposit box for irreplaceable documents. 3. Create a master directory. Create a financial directory in case something should happen to you. On it, you should list all of your financial accounts, from banking to insurance policies to investment accounts, along with your passwords and the names and phone numbers of any advisors that you use. Give this document to a close relative or trusted friend, or create an electronic document (in a very secure location on your computer!) and provide that friend or relative with specific instructions for gaining access to it if need be. 4. Stay on top of incoming mail. Because credit card solicitations and other printed statements often include your name, birth date, account number, and/or Social Security number, don't discard them without shredding first. If you don't use an electronic bill-paying system, I'd recommend logging any incoming bills on to a calendar as soon as you receive them. Note the date on which the bill should be mailed, who you owe, and how much. When you sit down to pay your bills for the coming week or month, this approach will help to ensure that nothing falls through the cracks. Great tips. Apply them and you'll save both money and time!! Well, the traffic ramp up here at Free Money Finance continues and I have so many people to thank, I don't know where to start. So let's start instead with a FREE giveaway. 2. U.S. mailing addresses only can get a towel. So send me your thoughts!!!! As far as thanks go, I'll start with you readers. I truly appreciate your continued visits to this blog as well as your comments. You're the reason I'm doing this. If you enjoy this site and don't mind, I sure would appreciate it if you'd tell you friends to stop by. As you may have noticed, I've added easy-to-use subscription links on the right side of this blog so anyone can sign up to get Free Money Finance with a few easy clicks. Thanks for your support. And thanks goes to those blogs who are much bigger than I am and that have helped me out by providing links to Free Money Finance. These include Instapundit, Outside the Beltway, Scobleizer (glad to see you back) and the Evangelical Outpost to name a few. Thanks for sharing your readers with me. Notice to all personal finance bloggers: the deadline for this week's Carnival of Personal Finance is approaching. The deadline for guaranteed inclusion is 7 p.m. eastern time on Sunday, July 24. Free Money Finance is part of this week's Carnival of Personal Finance with my post on The Two-Day Rule. Stop by to see some of the best personal finance articles on the web. I want to state up front that I'll be listing the posts in the order that I receive them. 7 pm Eastern time Sunday Night is the cut-off for guaranteed inclusion in the carnival. After that, I'll try my best to include you, but I can't promise anything. Free Money Finance is part of this week's Carnival of the Capitalists with my post on An "Expert" Debunked. Stop by to see some great articles on a wide variety of topics. Welcome to all of you who have read about Free Money Finance in the Wall Street Journal Sunday paper today. I'm so glad you stopped by and I hope you find your experience at Free Money Finance to be a good one. A couple week's ago, Free Money Finance was recognized by Business Week magazine and at that time I wrote a post that served as a tour of Free Money Finance. If you'd like to take the "official tour" as well to see for yourself what this blog is about, simply click here. Seriously, I wanted to let you all know that we'll be starting a new series on Monday -- one I think you will really like. You'll get some great ideas to help increase your net worth, and ones that will save you time as well. So tune in -- it will be well worth your time. Free Money Finance is part of the Carnival of the Vanities that was just posted today. My post on You Can Save a Bundle Without Having a Large Income is included. The Carnival of the Vanities is the longest-running carnival in the blogosphere. Stop by and see some great posts from a wide variety of blogs. You're sure to find something of interest there. For those of you who do not know what a carnival is, it's a collection of posts from many different blogs. The carnival is hosted (it "travels") by a different blog each week. The purpose of a carnival is to expose readers to new, interesting posts/blogs that they may have missed. So please stop by each of the above carnivals. You're likely to find a new blog or two that you absolutely love. Yesterday, I announced that we'd be expanding the free Moose Tracks ice cream t-shirt giveaways to celebrate both 5,000 and 10,000 visitors at Free Money Finance. I promised that it would be bigger than just the three t-shirts, but I didn't give details. Who won: EVERYBODY THAT POSTED A COMMENT TO ENTER A T-SHIRT!! Yep, that's right. All 17 people who posted will get something. For all the winners, send me an email with your name, address, choice of prize (if you are a grand prize winner), and size of prize (if it is a shirt). I'll then arrange to send you your item. Thanks to all who participated and congratulations! To everyone else, keep reading -- we'll be doing an even bigger giveaway when we reach 20,000 visitors!!! An off topic post, but I can't help but feel for the people of London and the UK this morning as they deal with the effects of a terrorist attack. My thoughts and prayers are with them. 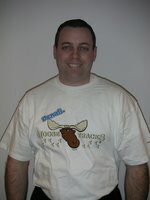 A week ago, I promised to give away three Moose Tracks t-shirts provided by our sponsor, Moose Tracks ice cream, to celebrate Free Money Finance's 5,000th visitor. Since then, a small little publication called Business Week named this blog as one that financial readers should check out, and traffic has exploded. As such, we're getting very close to celebrating our 10,000th visitor! (It will probably happen tomorrow!!!) Thank you again to all my loyal readers -- and welcome new readers. I hope you always find that Free Money Finance is a place where you get tons of great ideas on how to increase your net worth. So instead of just celebrating 5,000 visitors, we'll celebrate 10,000 as well. When this site reaches 10,000 visitors, the drawing will be expanded to be even bigger!!! All I can say is that it will be great -- I'm not giving out details. But if you want to win, all you have to do is simply leave a comment below this post or on the original 5,000th visitor post (you can say anything). Once the site hits 10,000 visitors (again, probably tomorrow), I'll select the three winners at random and post the results on this site. Then you can contact me and we'll arrange to get you your prize. Just a brief public service announcement about this blog and the way it looks. Hello to everyone visiting from Business Week magazine! Thanks for stopping by Free Money Finance. If you're wondering what this site is about, click this link to see the post I wrote a few days ago when the article came out. It gives you a pretty good overview of what this blog is about. Just wanted to say "Happy Fourth of July" to all Americans reading this. I hope you had a wonderful weekend and are having a wonderful day celebrating our great country. Since I won't be posting the rest of the day, I thought you might like to read some of the details behind my philosophy at Free Money Finance. They are neatly summarized in this post that I wrote a couple months ago. I was so (happily) surprised this morning to see that Business Week had mentioned Free Money Finance as one of ten financial blogs worth visiting. What an honor. Thanks goes out to my regular readers for their support. I love writing for you and looking for ways to help increase your net worth. An overview of what the site is about can be found on the top left portion of every page and is labeled as "About FMF". Of particular note, check out What This Site is About, Why Listen to Me, and Why This Site Exists. My general philosophy is summarized by five principles of handling money. Some examples of these in practical application are Get Rich Slowly, You Can Save a Bundle without Having a Large Income, Yes, You Can Lose 15 Years of Debt in 14 Months, and It's Not What You Make, It's What You Spend. People love to save money, so very frequently I like to post what I call "Money Saving Tips". These are quick and easy suggestions designed to save you money. Check out Get the Right Air Conditioner and Save Money with Energy Star as two recent examples. I'm a real person, so I write about what happens to me financially. Check out I Get Sooo Many Credit Card Solicitations, Bank Marketing Gone Bad, and Great Buy at Costco. Every once in awhile I get on my financial soapbox. See I'm Miffed at GM and Cost of a Pet is $48,000 as examples. I love to write on-going series and have so far written on The Best Advice I Can Give, The Best Deal I Ever Got, and The Best Advice I Can Give, Blogger Edition. I cover financial news and try to list stories I think my readers will enjoy. See Millions Impacted by Personal Data Loss and Money News. I track the net worths of financial bloggers as a hobby. Best of all, my site is sponsored by Moose Tracks ice cream. Hard to beat that, huh? :-) It's a great product, plus they give me great things to give away. We're giving away t-shirts now, so check out this post for a chance to win. Please look around and leaves comments or send me an email if you have a thought or suggestion. Thanks for visiting. Free Money Finance is part of this week's Carnival of the Vanities at Sophistpundit. My article on Yes You Can Erase Debt in 14 Months is included as are many great articles. Please stop by and read them all. You're bound to find some great blogs that you've never seen before. Just wanted to let you all know that we'll be starting a new series on Monday -- one I think you will really like. You'll not only get some great ideas to help increase your net worth, but you'll also be exposed to some wonderful new financial blogs. So tune in -- it will be well worth your time. If you need specifics on any of these items, simply click through to read more about it. Thus ends the (long) introduction. Starting next week, we'll begin working on the details. Free Money Finance is proud to introduce Moose Tracks Ice Cream as the sponsor of this site. It's great to have such a wonderful product as the site's main sponsor -- it not only tastes great, but it's a good value too (as good as or better than Ben and Jerry's and about 1/4 the price)! Moose Tracks -- The home website. Team Moose Tracks -- Highlights the efforts of Team Moose Tracks cycling team to raise money for an orphanage in Latvia. Also includes some great bike tips. Moosetopia -- A blog written by the Moose Tracks moose. Very entertaining. Denali Flavors -- The inside scoop from one of America's top ice cream developers. Thank you for visiting FreeMoneyFinance.com. Financial decisions are among the most important lifetime decisions to most people, and I hope by sharing my experiences and learnings, more people can start to make better personal finance decisions. Rule 1. Don’t rely on anything in this website for your financial moves. The materials on this web site have been prepared for informational purposes only and are not intended to be construed as financial advice. While I always make efforts to put each of my decisions into perspective in this blog, you should understand that rational financial decisions can only be based on each individual’s personal situation, and by default you should assume most of my decisions may not work for you. Rule 2. I am not your financial advisor. Reading this web site does not establish any kind of advisor-client relationship between us and I don’t have fiduciary duty for anyone whatsoever. If you are uncomfortable making your own decisions, you should always go to a financial advisor for suggestions to your specific financial situation. I welcome your email (you may email me at [email protected]) but again, any email communications between us does not constitute any advisor-client relationship either. Rule 3. I am not using this web site to promote anything. You should understand I may own shares or have financial interest in the companies, products, services or financial tools I discussed in this web site, but I have no intention to sell anything to you. If I discuss some products or services in this blog and make a recommendation, that's because I truly believe these products or services really provide meaningful value to ordinary consumers. If I will gain financial interest from a referral or alike, I will make efforts to disclose how much I will receive and in which manner to help you make a better decision. However, in no case can I guarantee the performance of every product and service I discuss, and I am not liable for any of your loss from trying these products or services. Rule 4. Advertisements will appear at FreeMoneyFinance. FreeMoneyFinance partially relies on certain advertisement income to offset certain expenses. Once expenses are covered, all profits from advertising will be given to charity. All ads will be clearly marked. FreeMoneyFinance does not endorse any advertisement. Please always use your best judgment while picking up financial products. Rule 5. All rights are reserved. The original material on FreeMoneyFinance.com is protected by copyright law and you cannot reuse or adapt the content in any manner without explicit written consent from me. If you want to discuss how to use content at FreeMoneyFinance, please contact me at [email protected]. Thank you again and enjoy FreeMoneyFinance! Thanks to my friend at PFBlog.com for the use of his Ground Rules. You also know that I have no qualifications as a financial advisor. But I do have some reasons why you may want to read what I have to say. It’s up to you. I promise that I’ll shoot straight and give you my honest opinions. I promise to tell you what’s worked for me, what hasn’t, and if I don’t know anything about a topic (like tax rates on foreign oil investments in South America), I’ll tell you. I promise that you’ll probably hear a lot of things that your mom or dad said, but you know what, mom and dad were right in many cases. I promise you won’t hear the latest get-rich-quick scheme, hot stock tip, or how to borrow your way to prosperity (unless you hear me telling you about how these are bad ideas). I promise I will give plain, simple advice that if you follow it, will consistently increase your net worth. I promise the site will feature articles, links to great sites, interviews with people who have something good to add, reviews of products, and anything else I can come up to help you increase your net worth. It should be a fun and rewarding time. I invite you (and your friends, family, and business associates) to join me. I hope you will visit frequently, add your comments, and tell your friends and family about the site that offers free and simple advice on money and finance designed to maximize your net worth. You also know, that I’m not qualified to give advice on this topic. (See yesterday’s post) I’m not professionally trained in financial management. I’m a layman in this field. Second, I have authored over 100 articles on finances over the past seven years that have appeared in many nationally recognized magazines. At least a few editors think I know what I’m talking about. Fourth, I have coached people on their finances over the past decade, helping many to get out of debt and get on the right path to increasing their net worth. Fifth, in the course of the past several years, I’ve read a gazillion books on personal finances, watched endless news reports, poured over countless magazines, and consulted many websites daily in search of financial wisdom. In other words, I’m self-trained. However, there is a reason for this site behind this reason. 3) Don’t know much about personal finances. I’ve found that there is a lack of financial wisdom, real wisdom, out there that is simple and easy to implement. Therefore, this site is an attempt to talk about finances in a simple, easy-to-understand manner that allows the reader to manage his or her finances without a lot of effort. All of this, of course, begs the question: How are you any different from the “experts”? I’ll get to that tomorrow. For now, I just wanted to share with you my reason behind the reason. Stay tuned. Welcome to a new financial adventure! I’ve wanted to put my thoughts down on this topic for some time, and I’ve decided that now is the time. I hope someone out there joins me (and helps me out with these thoughts by commenting/setting me straight), but if I remain alone, I’ll still get a lot out of this effort. All financial topics are subsets of net worth, and this blog will talk about them – but always with the goal in mind of increasing your net worth – making you (and me!) better off financially. You may have some questions about me and the site, and I’ll be addressing these over the next few days. For now, I just want to say welcome to Free Money Finance. Thanks for joining me.